Today I’ve got to talk about towing. I’m sorry if the mere thought causes your eyes to glaze over. There’s just too much dangerous misinformation out on the Internet, even coming from RV salespeople and people who should know better, and it’s going to get people killed. If you don’t read Airstream Life, you’ve missed out on a great series about towing issues that is authored by Andy Thomson of Can-Am RV. Andy is a second-generation Airstream dealer who specializes in setting up trailer hitches for best performance, and he does a lot of testing with his own vehicles to figure out what works. The series he’s writing for the magazine has gradually built up a case for optimal hitching, which involves a lot more than just “buy a bigger truck.” He’s gotten into the details like the overhang and angle of the tow ball, sway control, aerodynamics, engine power, suspension components, steering, and much more. Some of what he says is controversial but I think all of his points are very important to consider. I can’t begin to reach Andy’s expertise level, but I can talk about one simple piece of the towing puzzle today: weight distribution. Weight distribution is the idea that the tongue weight of the trailer should be evenly distributed across both axles of the tow vehicle. It’s horrifying that so many people don’t understand this concept, because it’s absolutely crucial when towing a trailer with a heavy tongue weight. By “heavy” I mean any trailer with over 500 pounds or so on the tongue. It doesn’t matter how big your truck is. It doesn’t matter if you “can hardly feel the Airstream,” or if you “never had a problem.” You need to get this right. Why? Because one day it will make a difference. That will be the day that you have to do a panic stop, or a sudden avoidance maneuver on the highway, or when the wind is blowing 30 knots off your starboard bow, or when you accidentally let the trailer drop a wheel off the edge of the pavement … and I could go on further with reasons why. One day, you’ll have to do ask your rig to do something extraordinary, and you’ll want it to behave. Without proper weight distribution, that rig you thought was so great towing straight down the road might do something really unexpected. Perhaps the rear brakes will lock up prematurely in a hard stop. You might not be able to control a sway, or stay on the road in a turn. You might feel the trailer “wag the dog.” Quite likely you’ll have an accident and afterward only know that something bad happened and you’re not sure why. You weigh the truck and trailer combination, and then the truck separately, to see how weight is being distributed across the axles. You take the rig on a closed course and drive it to the limits. The other day I saw some CAT scale readings from a fellow who was very confident about his truck and Airstream setup. By common knowledge, he was all set: big truck, no problem. But the CAT scale told a different story. When he hitched up his trailer, the rear axle of his truck got 1,900 lbs heavier. The front axle got 760 pounds lighter. That’s very bad but not unexpected. It means the weight of the trailer’s tongue, pushing down on the tow ball at the back of the truck, was actually lifting the front of the truck. Imagine a teeter-totter. The Airstream is pushing on one end, the rear axle of the truck is the center (fulcrum) of the teeter-totter, and the front axle is going up. When you lighten the front end that much, the steering geometry is affected. Now you’ve got understeer. You turn the steering wheel, but the truck doesn’t turn like it should. It’s like driving on ice. It’s insidious because you might not notice until you have to make an emergency maneuver at speed. A light front axle also affects the braking adversely, giving the front tires less ability to grip the road and slow you down. So bad steering, bad braking—you can see how this is really undesirable. With weight distribution applied on the same truck and trailer, the problem appears to the casual observer to be corrected. With the weight bars in place, the CAT scale shows that the rear axle is now only 1,000 pounds heavier than the axle was without the trailer (which is well under the manufacturer’s axle rating), and the front axle is now lightened by only 100 pounds. Everything meets the manufacturer’s specifications. That will work, but it’s far from optimal. The truck started with a nice 49/51% front/rear weight distribution. With the Airstream and weight distribution, the ratio has gone to 44/56%, which is not so great. It will drive OK under un-challenging circumstances, but it’s not set up well to deal with a bad day. Imagine a sports car with a huge lump of concrete in the trunk. Go around a sharp corner, and what happens? The sports car spins out. The truck with poor weight distribution may be more prone to the same thing. Unfortunately, as I mentioned above, the driver may not “feel” anything adverse until it’s too late. So how do you fix this? It’s actually quite easy to even out the load on the axles. The exact mechanism depends on the hitch system you’re using, so it may be a matter of just going down a link on the weight bar chains (on a Reese), or tightening the strut jacks (on a Hensley), or angling the tow ball rearward, or shortening the receiver to get the ball closer to the rear axle, or any combination of these things. The goal is the same: get those axles back to as close to 50/50 weight as you can, with the trailer hitched up. If you find that you’ve tried everything and can’t get the weight distribution any better, don’t give up. Hensleys are not great at weight distribution, but regardless of the type of hitch you use, check with someone who knows hitches. 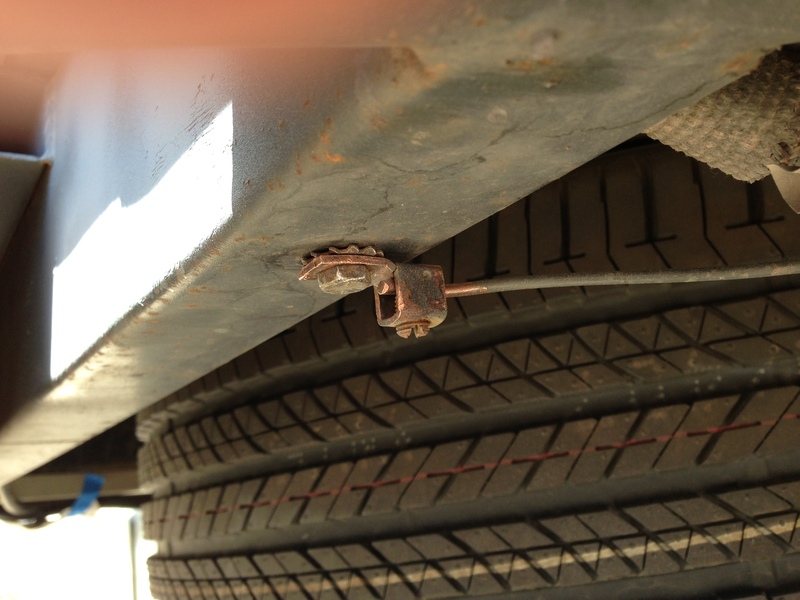 Sometimes the hitch receiver on your truck will flex so much that it acts like a spring, bending rather than distributing the weight stress. Reinforcement or repair may be necessary. By the way, if you followed the manufacturer’s instructions when setting up your hitch, and used the old technique of measuring the corners of the truck to see how much each dropped, you still need to go to a truck scale. That method is really obsolete today, with modern vehicles that have different suspensions front and rear, air bags, or even full air suspensions. At best, it’s a rough estimate. For about $10 at a CAT scale you can get the real story. If you didn’t know any of this, don’t feel like a noob. I’ve talked to RV salespeople who send people out the door every day with new rigs, who don’t understand the basic principles of weight distribution. I just hope I’ve impressed upon you that most Airstream owners need to check their weight distribution on a truck scale, because what you don’t know can definitely hurt you. I haven’t been looking forward to this most recent Airstream job. For a couple of years the A-frame on the Airstream (the front part, for those of you who don’t have a trailer) has been looking pretty ratty. Paint chips from rocks have turned into unsightly spots of surface rust, and the orange paint of the Hensley hitch has faded, then gradually fallen off, leaving large patches of rust. The paint on the top of the power hitch jack has chipped off too. It’s getting embarrassing, like the interior floor was before we replaced it last month. The problem with the job of repainting the hitch and A-frame is that there’s a ton of prep work and it’s messy. 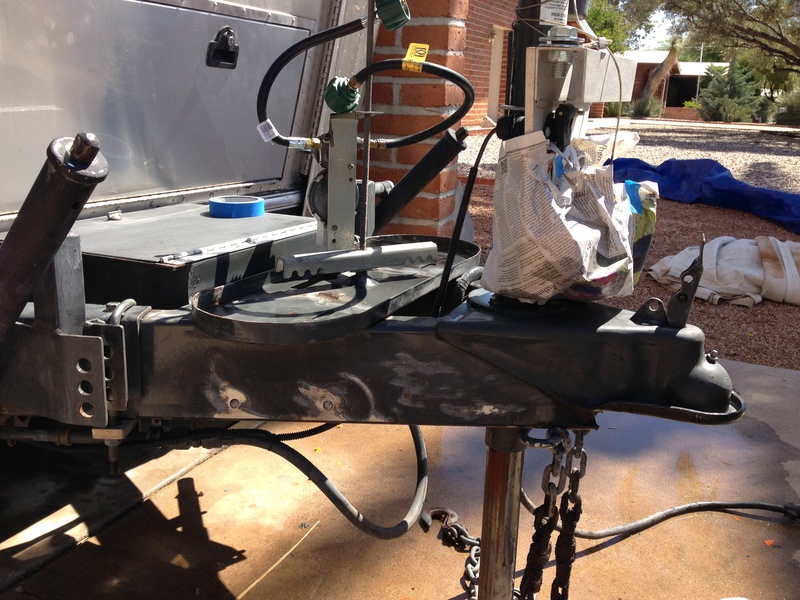 The Hensley is loaded with grease, which over the years has congealed with dirt and coated not only underside of the hitch itself but also the chains, coupler, and about a third of the A-frame. After removing all the hitch parts with the assistance of Mike, we dumped them into a large tub and degreased everything with industrial-strength degreaser and heavy brushes, then washed everything. This job took about an hour, and by the end of it much of the black grease was transferred to our bodies and clothes. Then we scraped the loose paint off with metal scrapers, and got the surface rust off with a wire brush attached to the power drill, leaving a surface of remaining paint that resembled a cracked dry lake. It was not pretty, but it was already an improvement over what was there. It really needs a good sandblasting and powder coating, but I’ve decided I will do this quickie scrape and re-paint just to get another year or two, and then I’ll take the whole thing into a professional shop for a proper & smooth job. The A-frame was less of a problem because Airstream used real paint (rather than that orange stuff that Hensley uses). It held up very well over eight years of heavy use and many miles. We only needed to touch up spots with the wire brush (after washing), and then wash again to remove all the dust. It should paint up nicely. After a lot of consideration, I’ve decided to paint the entire A-frame area in flat black. The Hensley parts will also be black, except the part that was orange which is now a metallic pewter. Black hides the grease a little better, and it’s an easy color to match for touchups. Those of you who own Hensleys might be wondering if I’m going to put the stickers back on. I have an entire set of replacement stickers, including the serial # label, but I’m going to keep them on hand and install them after the hitch is professionally stripped and coated. You might recall that I complained of our LED lights flickering when the water pump was running. I had considered several possible causes and solutions, including using heavier gauge wire to the pump, and adding a capacitor. I realized that all the solutions were aimed at the same symptom: voltage drops when the 12 volt electrical system was heavily loaded. And since nobody else with the LED lights seemed to be having the problem, it seemed most likely that I should try to find the cause of the problem rather than trying to patch it. With that in mind, the most obvious place to look was the main trailer 12v ground, which is (on my trailers) is located under the main frame on the street side, just in front of the spare tire. There’s a fat bare copper wire that runs to a little copper clamp that is in turn bolted to the frame. Since we were in that area with the wire brush, I disassembled the clamp and found quite a bit of corrosion on the copper and the steel frame. I brushed everything back to shiny and reassembled, then tested, and voila! no more flickering lights. I’ll coat the area with dielectric grease to reduce future corrosion. We used to know when the main ground needed cleaning because the Actibrake disc brake actuator would suddenly stop working. This happened a couple of times (Four Corners) (FL panhandle) and I got used to doing roadside clean-ups of the ground wire. The replacement Dexter brake actuator we have now doesn’t seem to be as sensitive to low voltage. So now the LED lights are our warning signal. I think as warning signs go, flickering lights is far better than having no brakes. The next job will be to paint everything. This time of year we get a breeze almost every afternoon, so we’ll either paint this evening around 6 p.m. if things have calmed down, or early tomorrow morning. Then, re-assembly, re-greasing, and adjusting of the Hensley. In between major jobs like this I’m working on the cabinetry and other small tweaks too. For example, yesterday I replaced four bellypan rivets with the big “buttonhead” ones because the pan was starting to come loose in the back. I also fabricated a small plumbing chase from leftover pieces of black walnut, to replace the factory one. The list of Airstream jobs that was a page long is slowly shrinking, and two of the four “big” jobs are nearly complete, so although time is short I think we’ll be ready to go to Alumapalooza in three weeks. In the Airstream universe you will find a curious phenomenon: passionate debates about caulk. That’s because the constant movement of all parts on the road causes all travel trailers to leak eventually, and a good caulk is our first line of defense against rain penetration. Rather unfairly, Airstreamers get more of this debate than owners of other brands, mostly because Airstreams have been around for so long, and so many of them remain on the roads after decades of use. 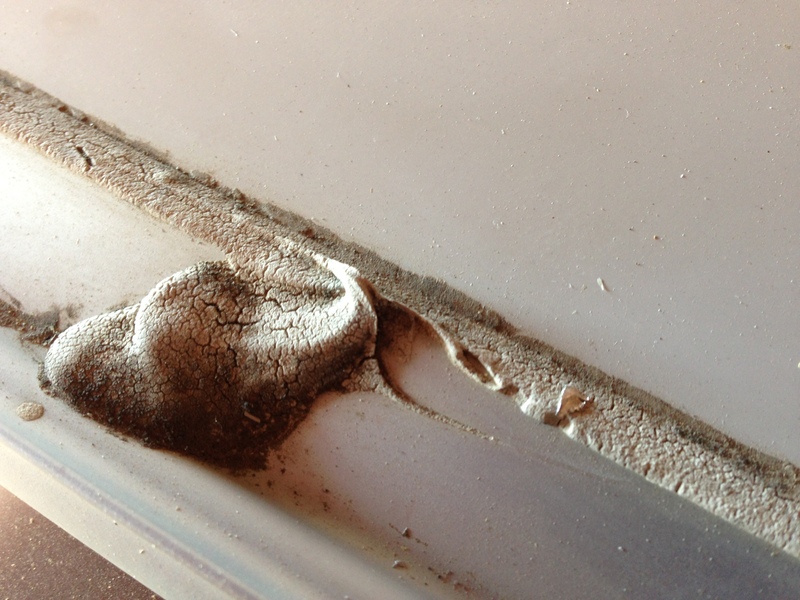 An Airstream might easily be re-caulked a dozen times over its lifetime. In contrast, “disposable” cheap travel trailers tend to get chucked into a landfill when they start to leak because they’re starting to fall apart too. You don’t hear the owners of those talking quite so much about re-caulking. They’re busy re-financing. 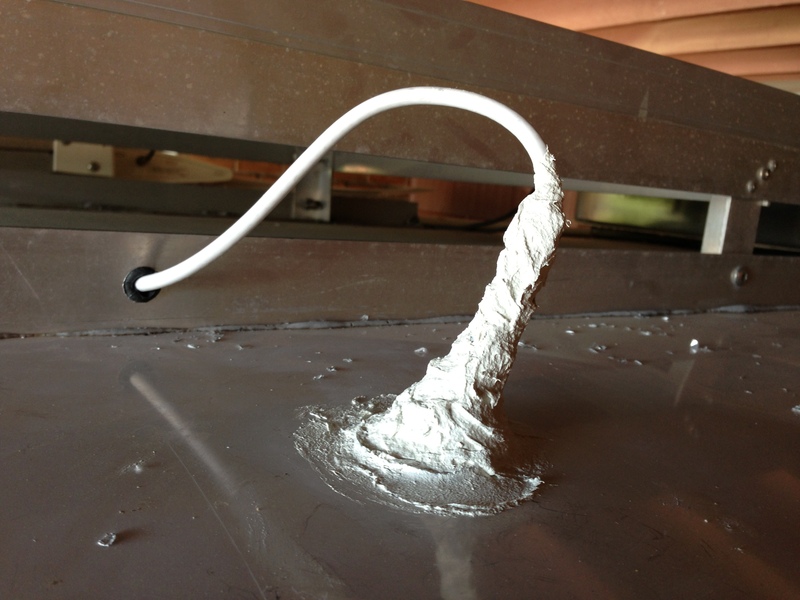 Another reason Airstreamers love to talk caulk is the aluminum construction of an Airstream. Silicone caulks don’t adhere as well to aluminum, so we tend to go for polyurethane caulks that are more expensive but stick like crazy and stay gooey for a long time. But what caulk is the “best”? 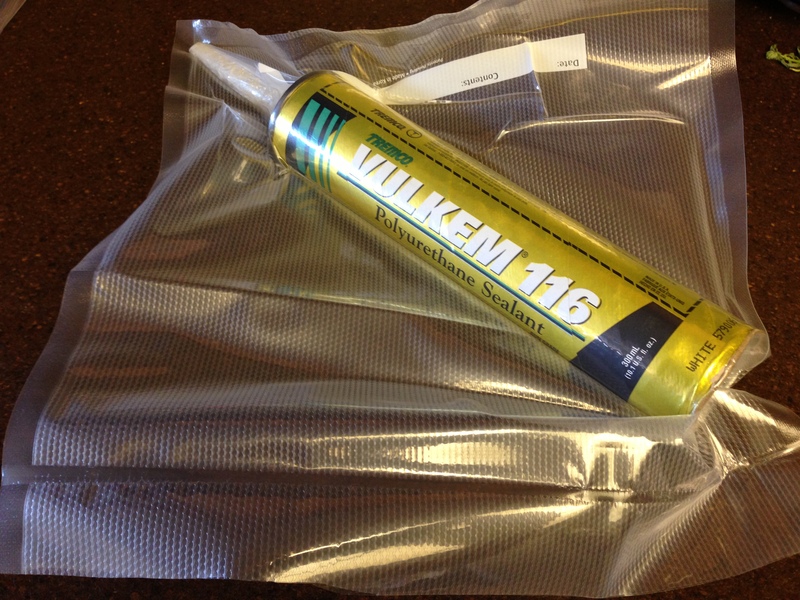 For decades, the gold standard of caulk for silver trailers was some gray stuff called Vulkem. These days Vulkem is just a brand name, applied to various formulations of polyurethane caulk made by Tremco. I use Vulkem 116 but you can also get TremPro 635 from the same manufacturer, and a few variants. Either way, it’s great stuff. It’s sticky like hot salt-water taffy and adheres to aluminum like glue, once cured it flexes a lot without breaking its seal, and it’s designed for exterior use (only) so it’s UV-resistant and completely waterproof. Finding the stuff is the problem. Lots of online sellers offer it but since a tube is anywhere from $6-14 and shipping tends to add $7-9, you want to get it locally or combine it with another order to duck the shipping charge. Locally it’s sometimes available through Home Depot or Fastenal, but here I couldn’t find it stocked anywhere so I had to order it. OEM caulk starting to break down after 8 years? You can always go to the local RV store and find products that claim to be roof caulk. I’ve tried a few and had uniformly disappointing results, especially the “self-leveling” type. Those RV-store caulks seem to be made for the disposable RV market, because they all break down in a few years under sunlight and start to crack, then leak. You can go on the roof of my Airstream and see what things (vents, antennas, etc.) have been caulked with the standard products; they’re drying out and starting to crack around the edges. I will have to go up on the roof sometime, scrape all that stuff off, and re-caulk. It’s not a job I’m looking forward to. And eight years is nothing. I’ve taken apart sections of my 1968 Caravel and found Vulkem contained inside joints and seams that was still good. That Vulkem was probably decades old. So that explains why I was willing to wait a week to get a tube of Vulkem 116 from an online seller. I used it to seal up the antenna hole for the cellular Internet booster. The hole was 3/4″ and the cable was only 1/4″ so I used a set of rubber grommets to fill in the gap, plus a 2″ tall rubber “boot” that I found at Ace Hardware. This formed a small tower on the roof, from which the new antenna cable emerges. Then I caulked the beejeebers out of the whole thing, sealing it completely. Two days later, the caulk still feels like it was fresh from the tube, and since it cures very slowly (just 1/16″ of an inch per day at 75 degrees F & 50% humidity) I expect it will take at least a week due to our low humidity. Fortunately, the Airstream isn’t going anywhere for four weeks. I’ll get back on the roof in late May to check on the antenna cable again, after having towed the Airstream 2,000 miles to Ohio, just to confirm that the seal is flexing appropriately at highway speed and not developing any gaps that could cause a leak. I’m pretty sure it will be fine. There are a few challenges with using this stuff. First off, the fumes are stinky and toxic, which may be why it’s not approved for indoor use. I would not use this in a workshop without having windows open and a fan. Second, it’s trickier to shape and smooth than silicone caulk, because it sticks to everything. The old “wet finger” trick that you use with silicone won’t work—it’ll stick to your wet finger. I strongly suggest wearing disposable vinyl gloves when you work with it, and bringing along a bunch of paper towels for cleanup. Third, saving the leftover tube is a bit of a pain. It’s hard enough to obtain that you don’t want to lose the leftovers between jobs. Some people put it in the freezer, which I think is a bad idea because the smell of the caulk can ruin your food, even through a plastic bag. I like my ice cream to taste like Oreo Mint, not vanilla Vulkem. I did warn you that the next few weeks would be mostly about Airstream maintenance, didn’t I? The job list on the Safari is pretty long, so I’m trying to tackle at least a piece of a project every day. The past few days Eleanor has been helping me with preliminary bits of the rest of the storage cabinets I started before our last trip. We’ve figured out how we want to assemble the cabinet and glued up some trim pieces with aluminum strips, as Kyle and I did before. I’ve also had the countertop made by a local wood shop. It’s black walnut, measuring about 18″ x 69″. You might think that would be monstrously heavy, but I had it planed down to 5/8″ thick so it’s just 19 pounds. Not lightweight, but reasonable for solid wood. We think it looks fantastic, even before final shaping and finishing, and I am really looking forward to seeing it finally installed. I’ll post pictures in a future blog. This is a job that the dealer will probably charge an hour’s labor to do, but you can do it yourself in less time. The trick is finding new replacement window operators. They’re called “torque operators” and they are Hehr part #008-192 if you’ve got the window knob on the right (as seen from inside the trailer). I found them online for about $8, and bought three figuring that we’d need a spare soon. Inside the trailer, open the window fully if it still works. Remove the black knob by removing the screw in the center. 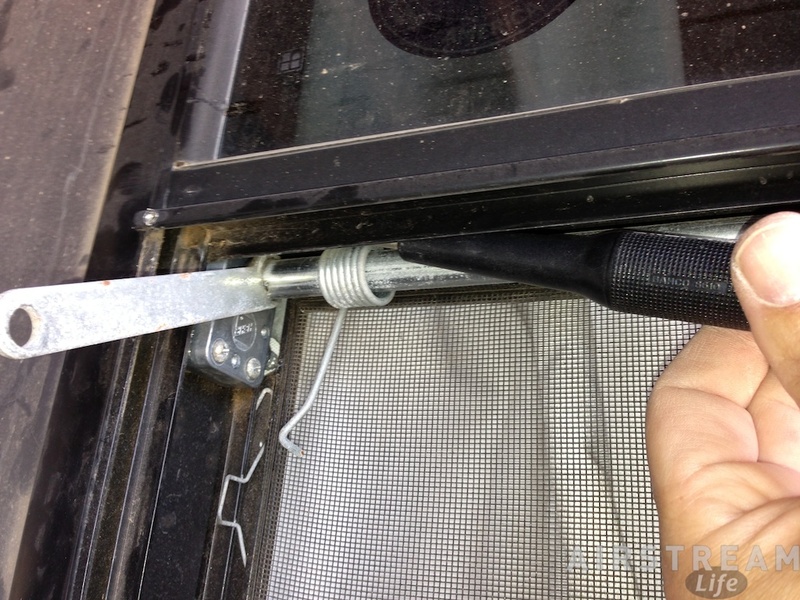 Outside the trailer, remove the two small black screws in the hinge just above the movable part of the window glass. Open the window (if it didn’t operate by the knob) and pop out the C-clips on the arm hinges (one on each arm). Pop the arms apart using the flat bladed screwdriver (one on each side). Now you can lift the window all the way up and either pop it out of the hinge or slide it sideways until it comes out of the hinge. Again using the flat screwdriver, pry the lower end of the spring off the upper arm so that the arm can move freely. Be careful not to puncture the screen with the spring. Do this on each side. On the right side, remove the screws that hold in the mount for the round bar. The top one will be hard to get to, so this is where the narrow handle of your screwdriver is crucial. On the left side, remove the three screws that hold in the torque operator. Again, the top one is a pain to get to. Drop the round bar down on the right side, then the left. It should come out now, with the torque operator attached. Might take some wiggling and cursing. Don’t let the springs and arms fall off, because that will just make your life harder. Remove the torque operator and note what a piece of crap it is. Scratch your head and wonder why they didn’t make it out of more durable material. Replace with a new torque operator, and wiggle the whole assembly of bar, springs, arms, and operator back into place. As they say, “installation is the reverse of removal.” Riiiiiight. Getting the top screw back in on each side is a pain. I taped the screw loosely to the driver and that helped, or you could use a magnetic bit. Getting the window back in the hinge is a hassle too. It takes a little force. A helper would be useful here, although I managed to do it myself in a few minutes. The rest is pretty easy. I’ve still got one more torque operator to replace on the other side, but with the Airstream in the carport I can’t get to it right now. That will be an on-the-road repair sometime in May or June. The third operator will sit in the box of spares until the Window Failure Lottery is complete and we have a known loser. And now we can open up a window in the bedroom and let in the air again!